For hundreds of years, Vermont furniture and cabinetry makers have carved out niches for themselves in the Green Mountain State, taking advantage of the area’s abundant and diverse species of trees including pine, cherry, maple, birch and oak. While some of Vermont’s biggest furniture manufacturers have closed their doors in recent decades, individual artisans have continued the tradition. Many produce high-quality, handmade pieces that are sought after around the world. In this story, Nest talks with three Vermont table makers with very different styles. David Hurwitz, of Randolph, has been carving wood since he was 6 years old. Now 48, the Plattsburgh, N.Y., native has earned a living as a professional woodworker for nearly three decades. Hurwitz’s experience shows in his works, most of which are made of wood and stone, nearly all of it sourced locally using certified sustainable practices. 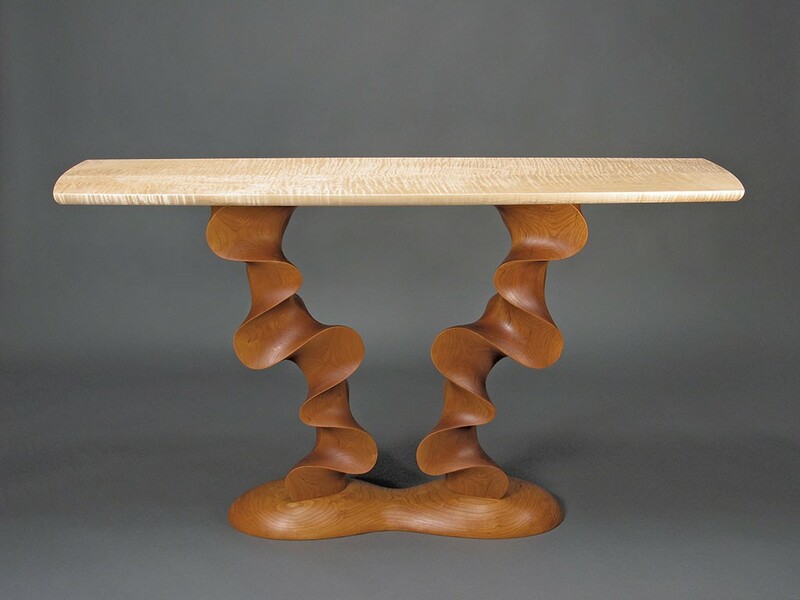 Many of Hurwitz’s tables and mirrors feature his signature style: wood carved smooth into rich, undulating forms that resemble flags billowing in a breeze or waves rippling across a pond. “I’ve always had a more organic sense of form, more curvilinear instead of flat planes and angles,” he explains. Growing up in the Adirondacks, Hurwitz adds, he’s always had a close affinity with the natural world. “And I watched a lot of cartoons as a kid, Dr. Seuss and so on,” he adds. Indeed, Hurwitz’s Seussian style has earned him national acclaim. In 2007, one of his pieces won the best-in-show award at the annual Vermont Fine Furniture & Woodworking Festival in Woodstock. In 2014, he was voted Vermont Woodworker of the Year by the Vermont Wood Manufacturers Association. Locally, Hurwitz’s pieces have shown at the Statehouse in Montpelier, Bennington Museum, Helen Day Art Center in Stowe, Frog Hollow Vermont State Craft Center in Burlington, Studio Place Arts in Barre and Furchgott Sourdiffe Gallery in Shelburne. Elsewhere, his works have been featured at the Houston Center for Contemporary Craft, the Wharton Esherick Museum in Pennsylvania, Denver International Airport, Delaware Art Museum and the Hickory Museum of Art in North Carolina. Because all of Hurwitz’s tables are custom made, it takes time to turn them around. Some dining tables take him two weeks; others two months. And, as he does all the work by hand, he typically has a six- to eight-month backlog. Six years ago, Dustin and Jessica Glasscoe founded Vermont Farm Table. Since then, the Charlotte couple has expanded the business, moving into a state-of-the-art woodworking facility in Bristol that employs four full-time woodworkers. The company has a retail outlet in downtown Burlington and a significant online presence. 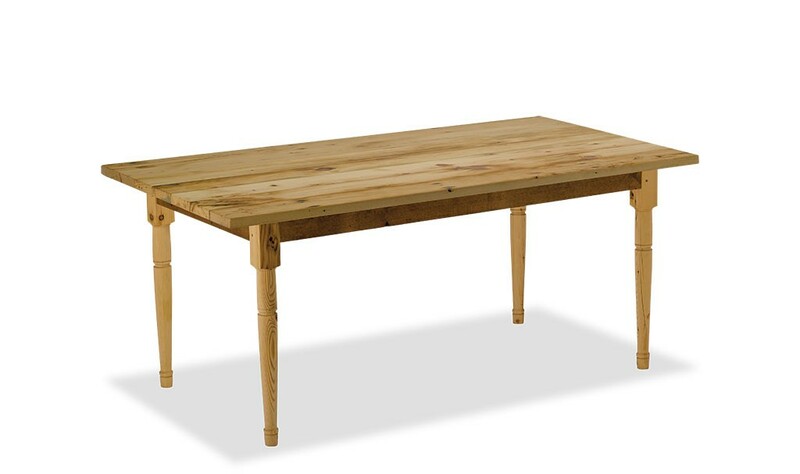 Vermont Farm Table has earned a national reputation for making its tables with solid wood, traditional building techniques and environmentally friendly finishes. All are custom-made to order. According to sales manager Sam Roach-Gerber, about half of the company’s tables are made from reclaimed wood from local barns, silos and other buildings; the new tables nearly all come from locally sourced wood harvests. 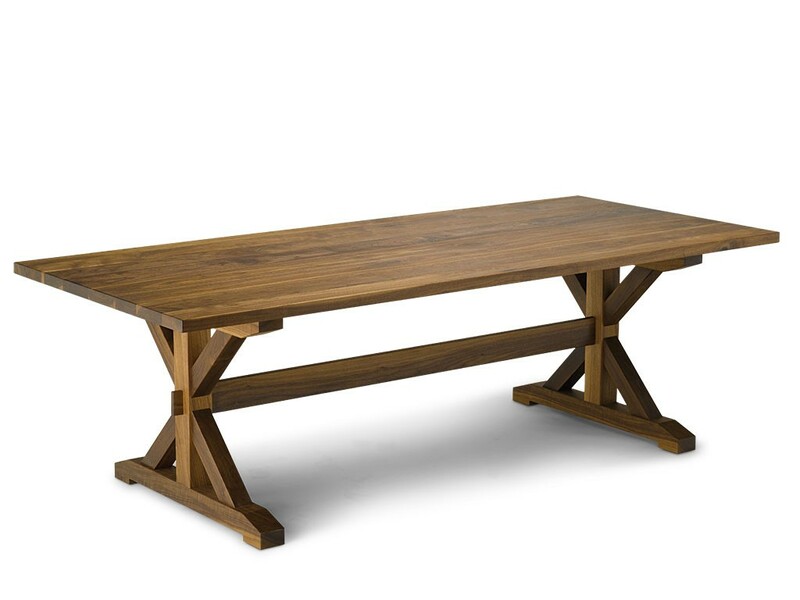 Vermont Farm Table’s pieces range from basic, no-frills square and rectangular kitchen tabletops to fancier dining- and conference-room tables. Roach-Gerber notes that the fastest-growing part of the business is actually commercial sales. The company’s tables can be seen at many Burlington restaurants including the Skinny Pancake and Hen of the Wood. 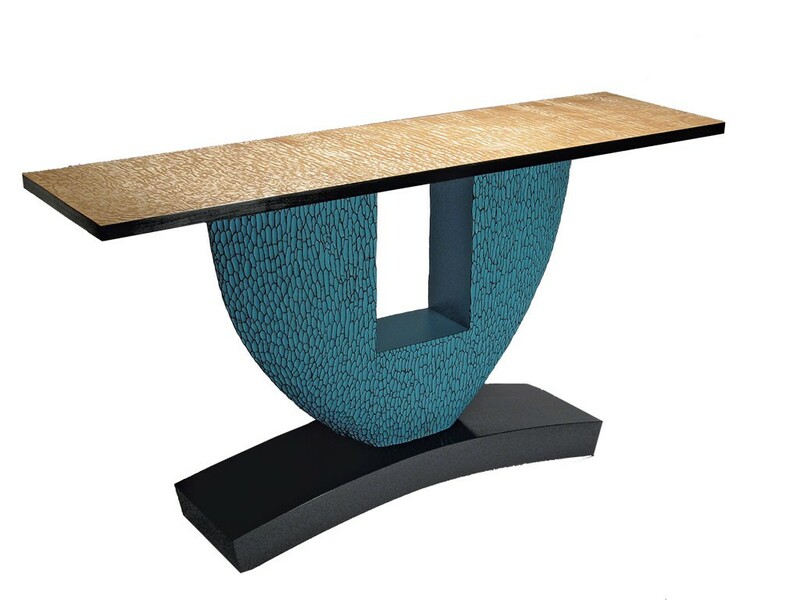 Elsewhere, VFT has made pieces for the Venetian hotel and resort in Las Vegas and Google headquarters in Mountain View, Calif.
Lester Bishop has been crafting tables and other furniture for less than two years, though you’d never know it from looking at his unusual creations. The 44-year-old Sheldon Springs resident left a career as general manager of Keystone Automotive Operations in Colchester a few years ago to devote himself full time to making tables, cabinets, kitchen islands and other furniture. Nearly all of his pieces, which are on display in the Colchester store he opened in April with his partner, Tammy McFarland, are crafted from reclaimed materials from Vermont’s agrarian and industrial past. None exemplifies Bishop’s approach more than his so-called Vermont History Table. He made the circular high-top using the flywheel from a 19th-century farm implement called a fodder shredder, which was essentially a horse-powered treadmill for shredding grain. The table’s base consists of an old wooden mold from the Vermont Marble Company in Proctor and a metal braking system forged in the old St. Albans Foundry. A similar table made by Bishop, which was purchased by 14th Star Brewing in St. Albans City, was made from a line pulley salvaged from a century-old machine shop nearby. The original print version of this article was headlined "Tabletop Exercises"